Added two new statuses for web orders in the Orders module (under Products > Orders). Sent to Store and Ready for Pickup are web order dispositions that will now appear for orders to be picked up in the store. Sent to Store indicates that the order is in transit to the store location where it will be picked up by the customer. Once the order arrives or once the order has been processed and is good to go, it can be marked as Ready for Pickup. If there is only one store location, then there is not need for the Sent to Store status and the order may simply be marked for pickup. Our plans for these states are to add automated notifications to be sent to customers when these dispositions are set. We have added the ability to edit the Option/Style Title and Values for a product (e.g. Titles such as Size or Color, and Values such as Small/Medium/Large and Blue/Red/Green, etc.). After clicking the product title to Edit it from the Products page, the slide out panel will now let you click and change the text and save. Be sure to click Save at the bottom of the page after you're done or your changes will not be saved. CAUTION: You should never edit an option value to change the nature of that value. Any edits made will appear on all past reporting for a product. A good example of where editing would be appropriate is if you misspelled a word, or need to use a different word such as "Tangerine" instead of "Orange." An example of where you would NOT want to edit is if you have a value "Medium" which has had sales in the past, and then change this value to "Large." After the change, all past sales for Medium will now show as being sales for Large. It is extremely important to not replace an old, out of stock option with a newer one for this reason, or all past reporting will be for the newer option instead of for the original. You will still want to Deactivate unused options and styles! 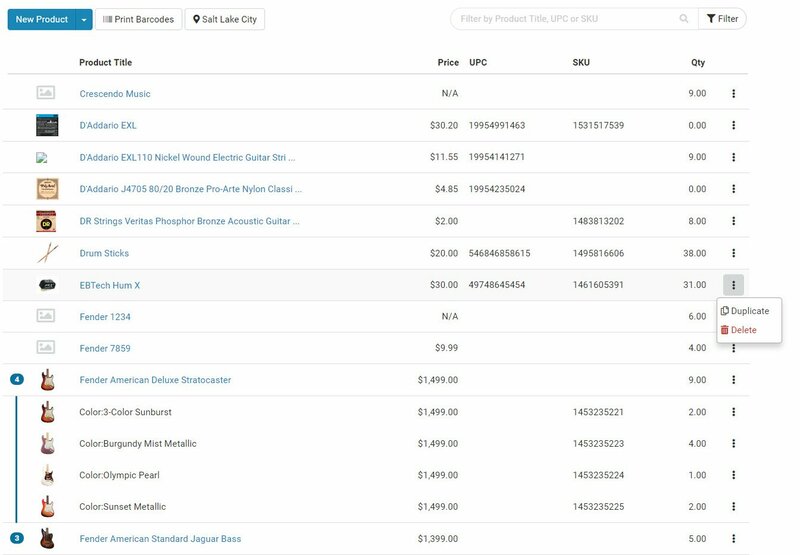 Improved the user interface on the main Products page so products with Options display more intuitively and working with Filters / Searches is more intuitive. Fixed an issue where the Sales By Item report would show the vendor as whichever vendor is assigned to the product, and not the vendor under whom the product was actually purchased. Fixed the "Check All" checkbox within the RO so that it actually checks or unchecks everything in the RO when clicked. The checkbox will not affect products that have had the quantity manually changed. It also does not display when creating an RO. It only displays when an RO is created from a PO.